Temperature Resistance (deg. Celsius): N.A. Bending Radius (mm): R-100/125/200/250 etc. M/s KONARK INDUSTRIES is regular manufacture & exporter of Redler chains (Drag Chain) for various sizes of redler such as 150mm, 200mm, 300mm, 400mm, 500mm & 600mm wide. We manufacture redler chain minimum 1000 Meter Per Month. INSUTECH now a world leader in the field of Power Transmission System for Material Handling Industry. The story of success began in 1981 with a modest beginning of EOT Crane spares. 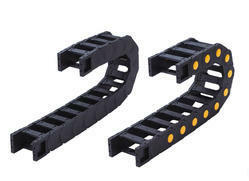 A highly durable, standrad, efficient plastic made drag chain black in colour having the inner dimensions of 25x38 and bending radius of 100 for housing the wires for the long life of numeric machine wires. 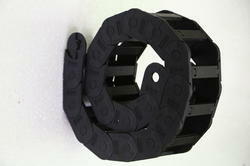 We are a unique name in the industry to provide our prestigious clients an exclusive range of Conveyor Drag Chain .